Multi Job Panelizer is a stand-alone software application to combine different single PCBs into high-yield production panels. It optimizes base material utilization while minimizing the number of different panel layouts and production batches entering the shop floor. Its modular concept and scalability make it the perfect tool for interactive as well as for 24/7 fully automated and unattended use. Multi Job Panelizer blends in naturally with any existing CAM environment, whether from Ucamco-or from a third-party software supplier. As an interactive tool, Multi Job Panelizer features an easy-to-use PCB placement interface, with neatly designed and intuitive function buttons, backed up by pleasant keyboard shortcuts. Various plug-ins for real-time panel analysis and optimization provide visual feedback during operation and guarantee unparalleled throughput and efficiency during the manual layout of a multi job production panel. This is the entry-level interactive editor for the manual creation of multi job panel layouts. The Job List contains the PCB jobs to be combined. The operator adds jobs manually and defines all parameters. The toolbox supplies the necessary graphical editing tools, real-time analysis provides the necessary feedback to the operator to build valid layouts. The Panel Preview area offers a preview of the resulting panel. A layout with just a high panel material usage is not enough. The plating process imposes strict requirements as to the copper distribution on the panel. Dense copper areas close to sparse copper areas lead to over- or underplating and cause unacceptably high scrap rates. Plating analyzer calculates copper distribution and gives color-coded on-screen feedback on the plating characteristics of the current layout. 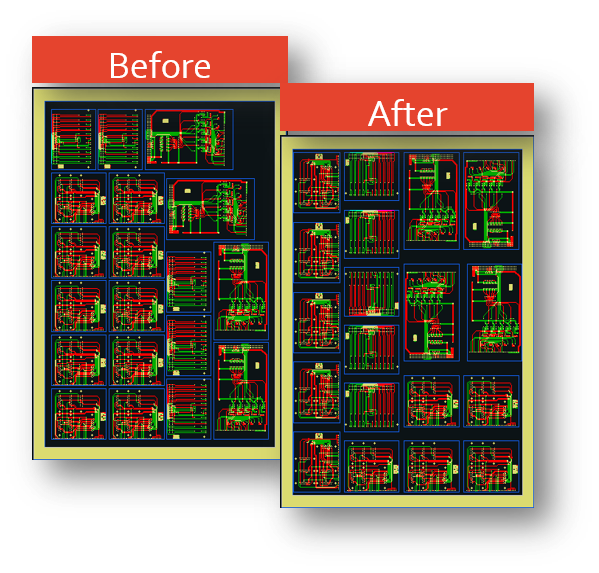 This assists the operator and the automatic modules in generating truly optimized layouts with low scrap rates. With the layout optimizer module, the system proposes alternative PCB placements for the currently edited layout. 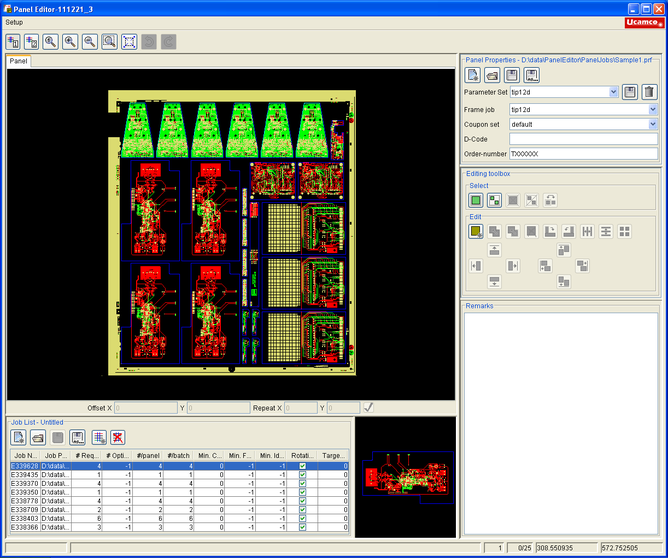 The PCBs are shuffled within the panel surface, allowing the operator to select the optimal layou. The clearance optimizer module can space the PCBs in the current layout over the full panel surface. 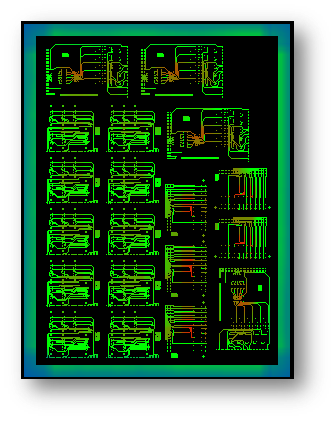 The geometric optimizer function calculates all possible panel layouts for a given set of PCBs. The proposed layouts can be sorted and filtered by their quality according to customizable criteria. In a fully automated version, multi job panel comes with an XML input and output interface to communicate to-and-fro with the master ERP or Production & Planning System. Its hot-folder server is constantly on the watch for incoming data and triggers multi job panelization runs at regular intervals or upon explicit request, as delivery deadlines are drawing nearer. Multi Job Panel’s integrated batch processing tool then interrogates the resulting list of possible panel layouts to single out the best ones, according to customer-definable criteria. Multi job panel outputs include anything from a textual panel description up to a full-blown production panel with combined single images, targets, venting, texts and logos, either in DPF, ODB++ any CAD/CAM interface format. At the end of this process, Multi Job Panel reports back to the ERP system what images have been processed successfullyso any left-oversare picked up in the next run.